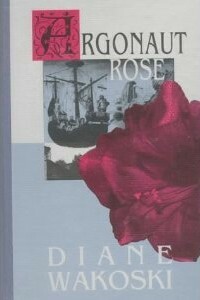 Recently I reread the only book of poetry purchased on my 2005 pilgrimage to Grolier Poetry Book Shop in Cambridge, MA—Diane Wakoski’s Argonaut Rose (The Archaeology of Movies and Books). My adventure getting to Grolier is a story for another time. Let’s just say it has something to do with a country bumpkin on a subway. Regardless of the challenges, every poet or poetry loving person must make the pilgrimage to Grolier. It sits right behind Harvard Bookstore on Plympton in Cambridge, MA. From the outside it looks small, but, inside, 15,000 volumes of poetry are stacked in several rooms, to the ceilings. Can you imagine that? Not at all like the big-box stores with their two skimpy rows of Milton and Bukowski. As a budding poet, I was overwhelmed by the choices. One of the poems I happened to read while still in Grolier was Beauty (for Tim Lane) . with its axe-handled crimson blade? The description of the amaryllis as the red sail of a flower ship, billowing out, in this poem is as striking as the flower itself is, in real live. There is also an amaryllis on the cover of the book. The work ties together—silver moon, silver apples, one missing sandal, an amaryllis—images that weave in and out of the poems, cover to cover. I can’t say that everything works for me in Argonaut Rose. I tend to prefer poems that I would consider to be ‘tighter’ than many in the book, with more of the–what feels to me–extraneous words stripped out. And, the book seems a little like it is trying to do too much all at once. It is myth meets quantum physics meets Wakoski’s life journey. While the poet does a good job of tying the disparate pieces together, there were some things that didn’t seem to fit as well, the references to quantum physics, for instance. That doesn’t negate the fact that the poetry is lovely. Wakoski’s style is hers alone with its varying line lengths, conversational (mater-of-fact) tone, and interesting line breaks. Even though by now, there are at least 100 additional books I would want to buy if I ever went back to Grolier, I am glad Argonaut Rose was the one I did buy in 2005. After I left that day, I sat in a café just off Harvard Square and read most of Argonaut Rose before getting on the train. I finished it later that night. How lucky for me that I got to go to the oldest, all-poetry book shop in America and buy a rose! This entry was posted in Bookstores, Poets I Really Like, Uncategorized and tagged Bookstores, Diane Wakoski, Grace Curtis, Grolier Poetry Book Shop, New York Quarterly, The Craft of Poetry. Bookmark the permalink.